When was the last time you used a phone directory to look for a business or service? If you’re anything like me, it’s just easier to Google for the information and take a look through the websites that are returned. A business that doesn’t have a website is much less likely to get my custom, as I do like check out the options online before I make a decision. If you’ve been lumping your website expenses in with the rest of your business overhead costs then you might be missing something important, particularly if you have a more complex business website or one that you use for sales or generating revenue in other ways. How you deal with your website expenses depends on how your website is used within your business and whether the expenses should be classed as revenue or capital. Revenue is what you spend to run the business in the current year. The money is spent (or at least owed) in the year and the item or service purchased is generally used up in the year. Revenue expenses get included in the accounts for the year to which they relate and reduce the profit for that year. Capital spending is when you buy an asset that will be used by the business for a number of years. Capital expenses get spread out in the accounts across the lifetime of the asset. For an example if you expect your new laptop to last four years before you replace it, you would include a quarter of it’s cost each year in the accounts for the next four years. Capital spending also opens up the possibility of plant and machinery capital allowances in the tax return. This article gives more information about capital allowances and why they’re useful to your business. In the past the view of what counted plant and machinery was just that. Capital allowances could only be claimed on actual, physical tools, machinery and equipment. These days the definition of plant and machinery is broader. 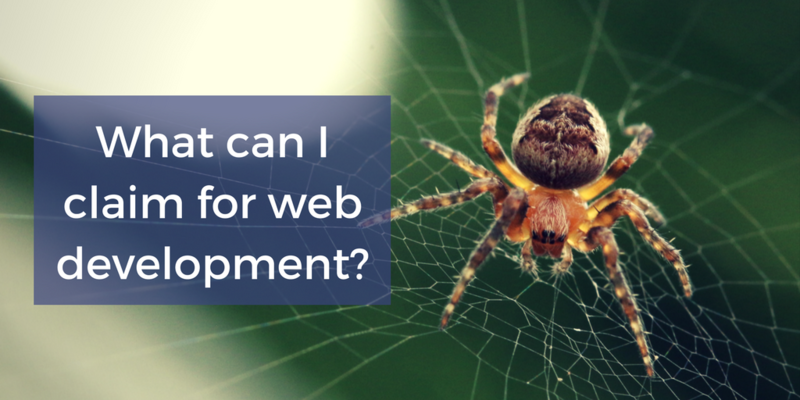 It recognises that although you might not be able to touch it with your hand, a website can be an important business tool and a long term asset. As a result some website costs do qualify for plant and machinery capital allowances in the tax return. But what type of website expenses are capital and which ones are revenue? Broadly HMRC view the website as a shop window. The cost of creating the website is a capital expense but the costs of refreshing and updating the display are revenue. To count as a capital expense the website also need to perform a business function beyond advertising. What is meant by a business function? This could include providing detailed information about products, allowing customers to order order or purchase products and services or to download digital products. It needs to help you generate sales directly or be important to the way that you generate your revenue. The site will need to have a lifespan similar to other capital assets. Within our accountancy practice we tend to use 4 years as a guideline, certainly 2 years would be too short. If this is the case then all the costs that relate to creating the website can be counted as capital expenses. These might include the domain name, design and development costs and any hardware or software that has been bought. These will be all ongoing costs of the website such as hosting, licence renewal costs and software subscription costs. It might also include development costs to perform minor updates such as refreshing out of date information. Research and planning costs relating to the initial site development can also be included as revenue expenses. You’ve will have seen them and you might have one; the simple one or two page website. It shows the business contact details, some basic information but doesn’t perform any essential business function beyond advertising on online presence. In this case all the website expenses count as revenue. The website isn’t contributing directly to sales or to the functioning of the business so it’s not capital expenditure. Things move quickly in the digital world and web fashions soon change. If your website has been used for a number of years and is looking shabby and dated then a total redesign might be in order. The costs of a major redesign, effectively a replacement of the old website, with a new site, on the same domain, can be treated in the same way as the initial development. These are capital expenses that can qualify for capital allowances. Similarly the research and planning costs can be included as revenue expenditure. With all these considerations to bear in mind, it’s important that your accountant has enough information about your website expenses to make an informed decision. This is particularly true if you’re setting up a new website or making a major changes. Give them the whole picture to help them work through the detail and deal with your website expenses in the right way.